Although the Japanese culture is something distant and very exotic, in recent years its individual elements have become an integral part of the life of many other countries. Among the good examples are Manga and anime. In this article, we will talk about the best applications that were created to read Manga, one of the kinds of Japanese art. 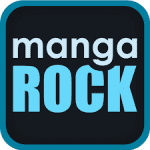 Manga Rock (Best Manga Reader) is an application for Android and iOS representing a real gift for comic book lovers. 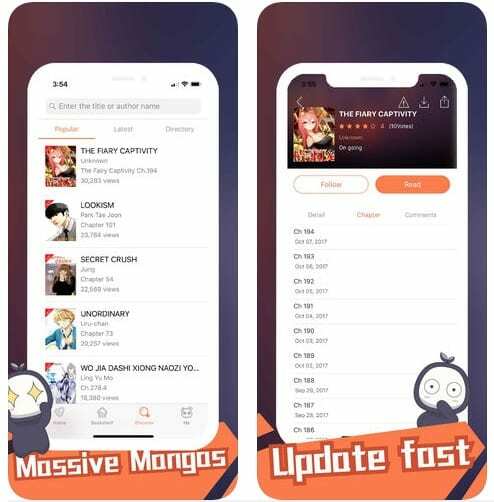 The new version of Manga Rock a bug related to the inability to recognize cards on some models of smartphone tablets is fixed, and also performance and speed are improved. Now you can enjoy your favorite comics at home, at school or on the road. The program is designed to be read on the screen of a mobile device. The app provides access to the largest library in this genre. With the help of the application, you can get acquainted with information from more than twenty sources! The program is easy to manage, equally well displays information both for horizontal and vertical orientation of the display. The possibilities of software also allow you to reduce or enlarge the image, adjust the brightness. For a fuller perception of information, a full-screen read mode is provided. The search tool with the advanced system of filters, used in software allows finding any manga on the Internet. Te parallel download mode is supported, which provides a high speed of downloading content. Then, the downloaded information can be saved to the SD card. The most liked comics can be placed in the “Favorites” panel and provide instant access to them. The program is easy to manage and configure. The user interface is equipped with large, intuitive control buttons. Meet with the novelties of the genre one of the first and evaluate all the features of the application! Perhaps one of the best applications for reading manga. Every day you will have the opportunity to read new chapters of your favorite comics. You can download the manga in offline mode. For ease of reading, the application provides a bookmark mode. You can choose from single or double-entry landscape reading. Interactive table of contents will help you quickly move to the chapter you need. Every day new free chapters are added, which you can gather in the collection. In the application, you will find both classics (Death Note, Hunter x Hunter), and mega-hits and digital exclusive series. 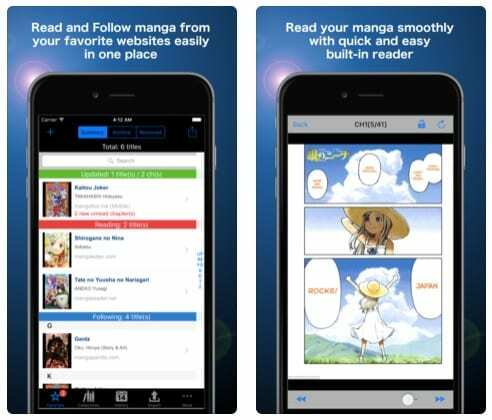 A great application for reading Japanese comics right from your smartphone or tablet, developed by the leading company in the country of the rising sun. The best manga is available for! 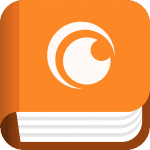 With this application, you can access the best publications on the same day when they arrive on Japanese bookshops: Fairy Tale, Attack on Titan, Naruto, One Piece, Uchū Kyōdai … You will not miss any of the most popular manga. Access to virtually unlimited catalogs of manga-comics. 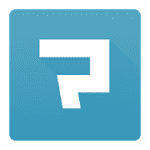 Filter content by the most popular, genre or newly added. Each manga is divided into chapters, for more convenient reading. Description and information about the author, publisher, and artist for each comic. 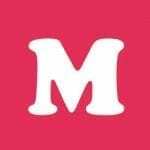 The application will appeal to all fans of the anime and part-time readers of the manga on a smartphone or tablet. 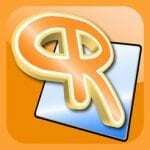 The application perfectly adjusts the document image to the screen, making all the elements readable. All manga comics are absolutely free to read. Here are collected both ordinary manga comics and the authors of the most popular publications. Every day the application is updated and new comics are added. So you definitely will not be bored. For better performance of the application, it is recommended to use Wi-Fi. A great application for those who read comics a lot and often. It distributes your library into sections, so searching between your comics becomes even easier. You can view your comics by publisher or series. Also, it analyzes and shows all unread comics, the last ones open and added in the last two weeks. In the application, you can also configure the statistics of the read. ComicRack is also on the PC. You can synchronize your libraries between your computer and your smartphone. It has a convenient interface, as well as support for CBZ, ZIP, CBR, RAR and PDF formats. In combination, the application is also an advanced manager of downloaded comic books, allowing you to create your own orderly collection. The key features of the presented “reader” include support for full-screen reading mode, the ability to add bookmarks and import a list of comic books from the virtual library to a CSV file. 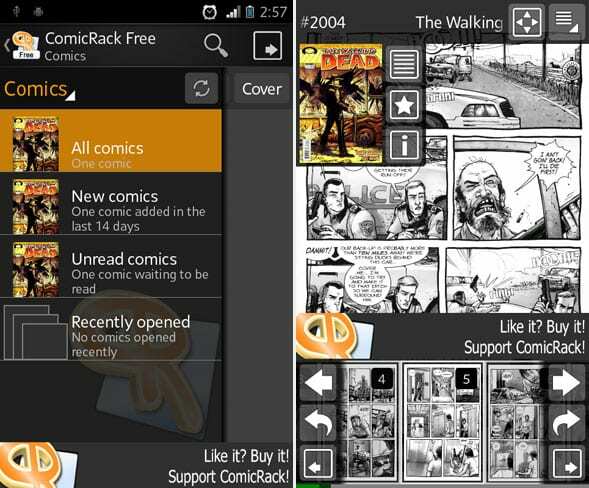 The interface of ComicRack cannot be called modern and technologically advanced, but still, it is easy to use and has a competent structure. In general, we have a very good solution, and it’s completely free. An interesting feature of the application is the ability to use comic book covers as live wallpapers. One of the best applications created for reading Japanese comics is MangaZone. The utility takes up a little space on the device, it is installed quickly without additional settings. After starting, you can see little tips on how to use it. Opening the utility, on the main screen, a catalog of collected works appears. Large letters write the name of the story, below you can see the genre to which the story belongs, followed by a short announcement of the record. Near each work, on the left side is a miniature cover of the magazine. To open any story you like, click on it with your finger once. On the opened page there is information about the author, the original title, and buttons for viewing chapters and further reading. To view all images, you need to do a slash down, and to flip the page, you need to make a shift to the right to the left side. At the top of the screen, you can see the open chapter and page. You can choose a manga from a variety of categories, comment on the read, set the page orientation blocking, and much more. After exiting the reader, you don’t have to remember the page: the program automatically remembers the stop time of reading. To continue, you will only need to click on the “Continue reading” button. Clicking on three vertical bars, you can go to the utility directory, open bookmarks, go to the download queue. 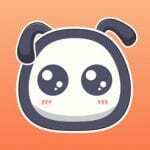 Manga Dogs is an application that allows you to download and read thousands of different manga series on your smartphone or tablet. You will have a manga available in six different languages (including English, Spanish, and Portuguese), which you can download from more than 10 different sources. With the help of Manga Dogs, you can read manga comics right in the application or upload them to your device to read later without connecting to the Internet. In read mode, you can configure options such as changing the reading order, page orientation (horizontal vertical), and brightness adjustment. One of the most interesting options in Manga Dogs is the ability to create your own virtual manga library where you can store a collection of your favorite comics. How to search for manga? Easily! You can use the search field to find a specific manga or use a filter to perform a selection by genre or title. 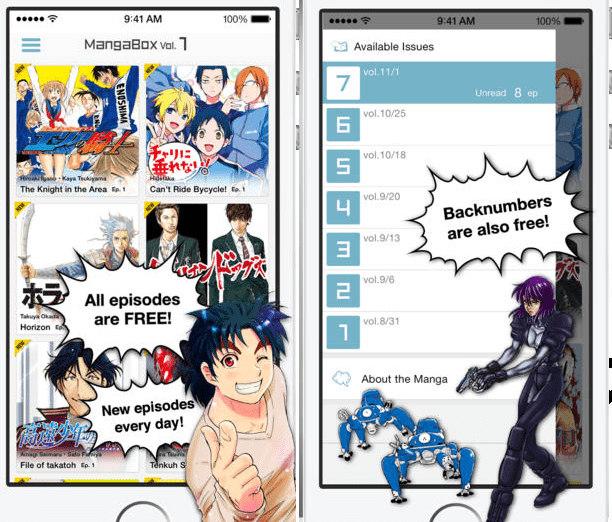 Manga Dogs – a functional application for reading manga. You can read manga online or download chapters to read them later without being connected to the Internet. And most importantly – all this is done through a simple and convenient interface. One of the best applications for reading manga. 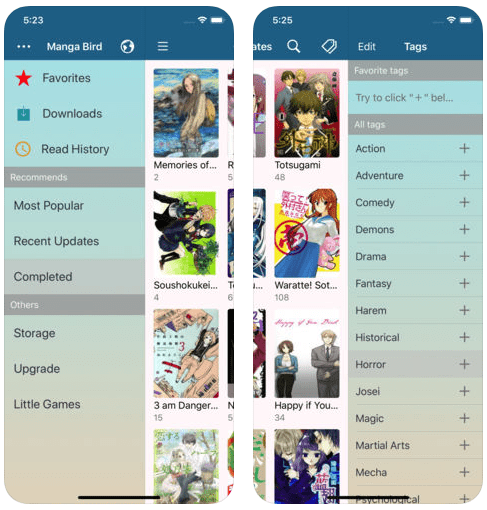 Manga Reader is perfectly optimized for tablets and phones and is completely free. the ability to backup and restore functions for comics. 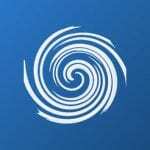 The application has a very simple and intuitive interface, the developers have done a great job. After the start, we recommend (in the settings) to select the sources of the manga for use. Very friendly interface and beautiful design. Also realized the possibility of downloading comic books to your phone and adding to your favorites. Reader, designed to read exclusively manga. Not that reading a manga is fundamentally different from reading Western comics, it’s just not possible to open local files in this application. 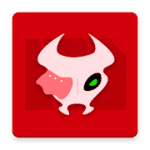 Manga Searcher-Manga Reader consists of two extremely simple utilities – search engine/loader manga from the Internet (the utility supports ten servers with manga) and the actual reader. There are almost no settings for the application, the reading mode also looks minimal to the limit – the utility remembers the progress of reading, double-tapping allows you to scale, touching the edges of the screen scrolls the manga forward/back. There is the possibility of automatic switching between portrait and landscape modes, but there is no automatic scaling “on the width of the page”. In addition, the application shows ads, not in the menu but in the process of reading – occupying a useful part of the screen and distracting from reading (with the ability to pay the developer and get rid of advertising is missing). In general, the only thing that justifies all listed shortcomings os Manga Searcher-Manga Reader is the convenience of downloading the manga. 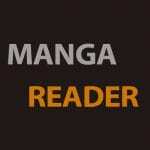 A simple and convenient reader for manga. You can read online or download and then read offline. You can also add manga to your favorites and track the addition of new chapters. The application uses various sources to find the manga. Here you will find a lot of anime videos. And after reading the comic, you can leave a comment and share your opinion about what has been read. 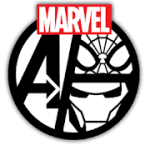 Marvel Comics is an application that allows you to buy, download, and read thousands of Marvel comics directly from your mobile device. You can turn your mobile phone or tablet into a real virtual comic book store. Marvel Comics users have access to a collection of more than a thousand Marvel comic books, including the complete collection of comic books Spiderman, Avengers, Thor, Captain America, Iron Man, and Deadpool, etc. And although most comics available in Marvel Comics will have to be paid before you can download them, every week you’ll find comics that are completely free. To download these free comics, you only need to click on the file and store the comic in the device’s memory. Marvel Comics is the perfect app for all Marvel comics fans, as it allows you to buy and read the most popular and the best comics in the world. Another great reader for comic book lovers. 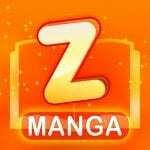 ZingBox Manga will please you with an excellent design, user-friendly interface, and an unrealistic variety of additional features. A separate bonus – you can read without the network. After startup, the utility offers to choose one of 12 languages. On the main page, after selecting, manga works are displayed, broken down into categories: popular, the latest updates or the original manga. To view the updates, click on the corresponding button. Clicking on the “category” button, all genres of Japanese culture are displayed. Clicking on one of the stories, you can see on the screen not only the announcement of the entry, the category and the name of the author but also read the reviews of fans of this genre. In the right corner, there is a button, clicking on which you can share your favorite comics with your friends. At the bottom of the screen, there are buttons for navigating to downloading, adding to favorites, and also for viewing the list of downloads. To read all the reviews, click on the “discuss” tab. While reading the comics to change the brightness, click on the image of the sun, at the bottom of the display. To change the layout of the pages there is a button with a picture of a leaf with an arrow. To change the orientation of the screen, click on the thumbnail of the phone. 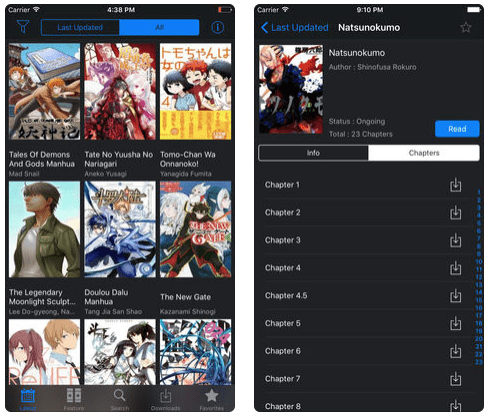 Another application for reading manga on your Apple device. More than 1000 free comics are available for you in different languages. A simple, beautiful interface will make reading manga even more enjoyable. 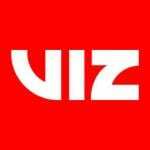 The app will notify you about the release of a new chapter of your favorite comics. 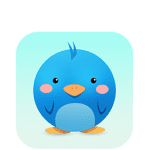 To make it easy for you to read, the application provides horizontal and vertical viewing mode, as well as night and day reading mode. You can use the bookmark to start reading from the right moment the next time. There is support for Zoom In/Out, as well as changing the brightness, cropping pictures, and locking the orientation and much more. 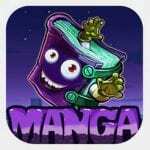 With this application, you will receive a huge library of manga comics for reading. In addition, the program itself will recommend you a manga based on your preferences. You can also see which comics are now most popular and what other users of the application read. If you read the online manga, then the next chapter will be automatically downloaded in the background. A convenient feature of the application – starting to read the comic on one device, you can continue reading on the other. 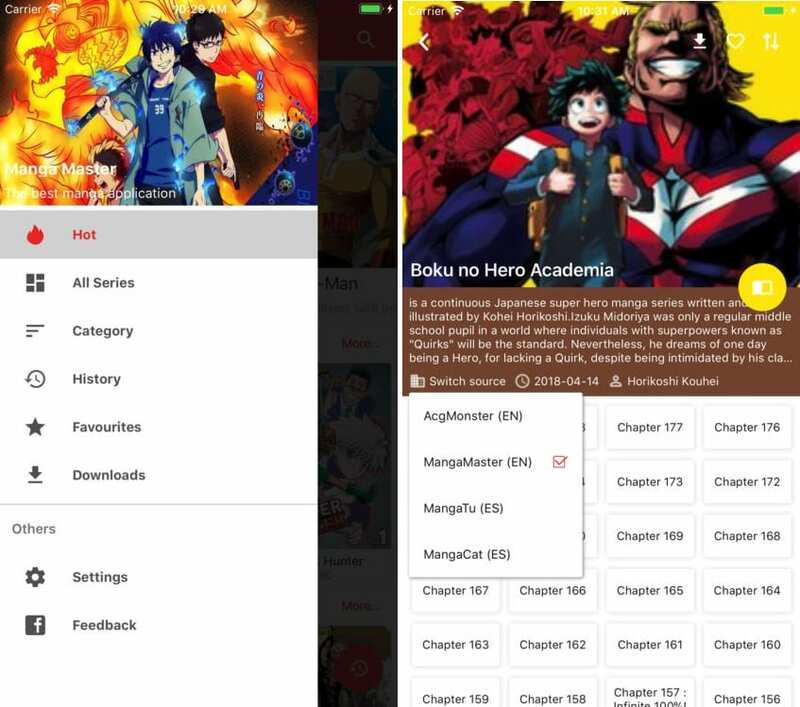 Downloading the Manga Box application, you will be able to download the manga to your device to read offline. 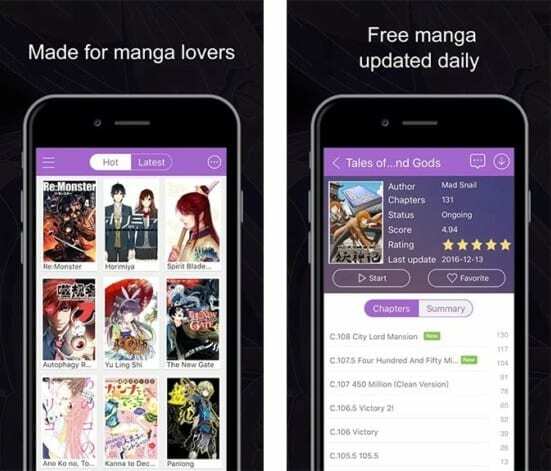 Looking for a good app to read manga on your favorite websites? 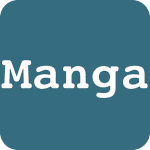 Manga Storm is a simple but effective manga reader providing high-quality reading along with a large number of different functions made by developers. You can add manga from your favorite sites directly to this application just by entering the URL of the site or using the built-in browser. A list of what you have already read or are about to read greatly complements the reading process – you will not stumble upon what has already been read before. Your progress in reading is saved automatically. Also in the application is a very good design. You can download the manga to your phone and read it anywhere, anytime!